George Barnett Photography is a full service professional photography business. We market and sell licensing rights to high quality wildlife pictures, hunting photographs, fishing photographs and other outdoor related photography. Our extensive stock photography files contain over 150,000 wildlife pictures, hunting photographs, fishing photos and other outdoor related pictures. We have both film and digital capabilities and can submit pictures in either format to meet your companies specific photography needs. For Information on our New Searchable Picture Galleries, enabling buyers to view a larger selection of low resolution images, Click Here. Our photo files contain pictures of some of the largest and most beautiful whitetail deer in the Outdoor Industry. They include some of the biggest bucks ever recorded on film. George Barnett photographs the whitetail deer in a variety of settings from both Northern and Southern states. His files include pictures of numerous habitats, behaviors, portraits and action scenes of this magnificent animal. Visit our Picture Galleries for low resolution samples of his excellent photography of this species. Other outstanding images of species such as elk, mule deer, bighorn sheep, grizzly bear, black bear, upland gamebirds, turkey, pheasants, and predatory species such as mountain lions, coyotes and wolves can be found in the Picture Galleries. We also distribute some of the finest action and scenic bass fishing pictures in the industry. Visit our Picture Galleries. for examples of pictures of largemouth and smallmouth bass, trout , catfish and other popular fish species and fishing scenes. For a full description of wildlife pictures, hunting pictures and fishing pictures available from George Barnett Photography, visit our Stock List Page or, to view a larger sampling of images, be sure to visit our new Searchable Picture Galleries. For information on Submission and Pricing Guidelines, Click Here. Our goal at George Barnett Photography is to create and provide the very best, high quality pictures that bring your advertising ideas to life and customers to yo ur product. Never underestimate the power of effective, high quality photography in your marketing and advertising efforts. Nothing garners attention faster then great photography surrounding your product. Nothing turns a customer away faster than poor visual effects, even when the product itself is good. Whether your objective is a scene marketing your latest bow, firearm, or camouflage clothing, a whitetail buck responding to your latest scent product or call, or a huge bass thrashing the water's surface with your newly developed lure, George Barnett Photography can develop the creative and dramatic imagery needed by companies to meet their marketing and advertising needs. Our corperate clients utilizing our wildlife, hunting and fishing pictures include some of the largest companies in the Outdoor Industry including Bass Pro Shops, Cabela's, ESPN, The Outdoor Channel and Sportsman's Channel, Mossy Oak/Biologic, Mossy Oak Graphics, 3D Picture Store, Carry Lite Decoys, Purina, Pennington Seed, Nikon, Bushnell, Weaver and Simmons Optics, Zebco, Lowrance Electronics, Kenco, American Hunter and Moultree Feeders, Lohman and Madd Calls, CVA and Remington Arms, API Outdoors, Evolved Habitats, Buck Grub, Wildgame Innovations, Tinks, Code Blue, Hoyt, Easton, Carbon Express, Scent Lok, PSE, and, Benelli, Franchi and Stoeger Arms to name only a few. Our wildlife, hunting and fishing pictures have appeared on over 600 magazine, calendar and book covers, including Outdoor Life, Field and Stream, Sports Afield, Buckmasters, Petersens Hunting, Bassmaster, Bowhunter, Whitetail Journal , Cabela's Outfitters Journal , North American Whitetail, North American Fishing and many other national publications. Visit our "Examples of Work" page to view some samples of our commercial and editorial photography. 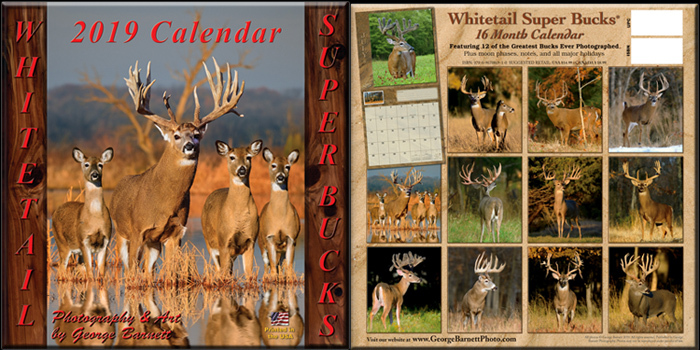 George Barnett publishes and distributes the Whitetail Super Bucks® Calendar, the number one big buck deer calendar in North America. This 16 Month deer calendar includes pictures of some of the largest whitetail bucks ever photographed in North America. 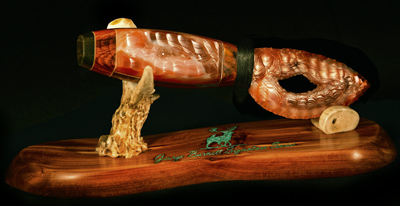 All bucks gracing the pages of this beautiful calendar will score over 200 Boone and Crockett points. There are no small "filler" buck pictures in this calendar, only big, massive monster whitetail bucks! If you are a fan of the Whitetail Deer you won't want to miss this book, or George's outstanding calendar, the Whitetail Super Bucks® 2019 Calendar. Click Here to Order. 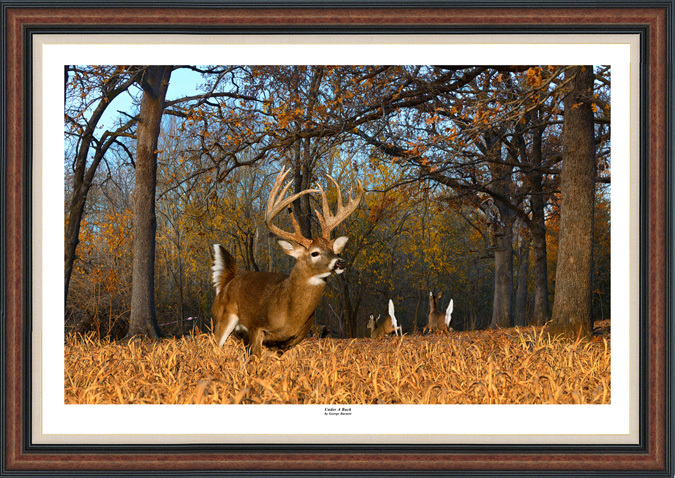 "Under A Buck", our second release from our "Great Escape Series", pictured below, is now available for purchase. Prints from the "Pack Series" The Six Pack, and The Snow Pack, The Swamp Pack and Above and Beyond (All Framed for illustration only), are also available for purchase. Click Here for Details concerning the artwork and how you can purchase your copies Today! 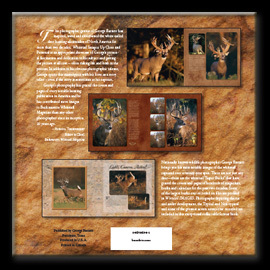 Whitetail IMAGES - The Book! 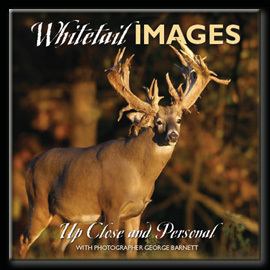 George Barnett's newest book Whitetail IMAGES: Up Close and Personal. Now available for $19.95, this exceptional coffee table book features over 200 of George Barnetts outstanding whitetail images. If you are a fan of the Whitetail Deer you won't want to miss this book. For more details on this exceptional coffee table format book, or to order your copy, Click here . George Barne tt Photography also owns and operates Image Ranch, a 21 acre outdoor photography facility dedicated specifically to producing quality pictures for the Outdoor Industry. Imag e Ranch was designed and built exclusively for creating custom imagery to meet the needs of the ever expanding Hunting, Fishing and Outdoor Industry. The facility houses a number of wildlife species including a herd of whitetail deer conditioned to work in front of a camera. Contact us via e-mail if you are interested in a custom photo session at Image Ranch. All photos published on this site are copyrighted and protected under Federal Copyright law. They may not be downloaded or used in any manner without written permission from George Barnett Photography.